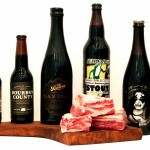 DrinkingCraft.com did a little survey for this recipe. 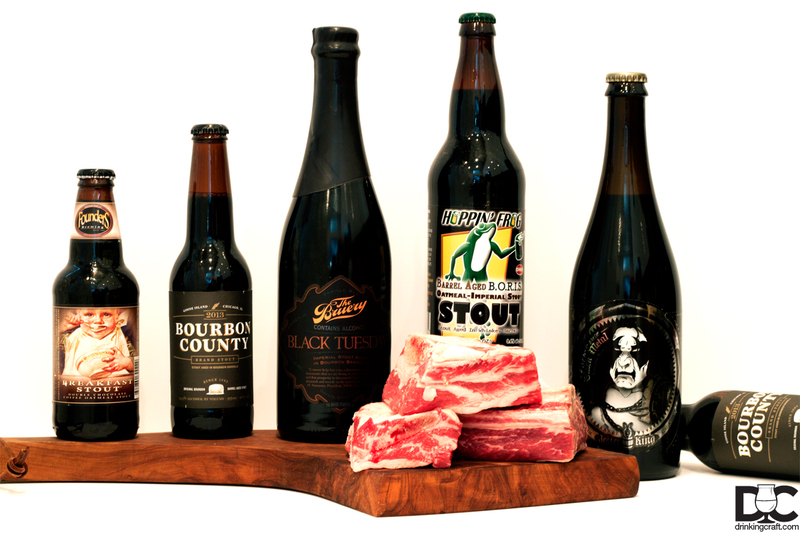 We asked which craft beer out of a healthy list of stouts would you like to see used in our braised short rib recipe. After taking in thoughts and advice from our DrinkingCraft.com friends and family we decided to go with Founders Brewing Breakfast Stout. Talking with some other chefs, they had better experiences with craft beer lower in IBU’s. Founders Breakfast Stout comes in at 60 IBU’s, which along with the chocolate/coffee notes, we felt was perfect for a braising liquid. We know it may not be possible to get Founders Breakfast Stout in your area, so please replace it with your favorite low IBU stout or porter and give it a go! Place the short ribs on a baking sheet and season generously with kosher salt & pepper and set aside. Proceed with portioning out the rest of the ingredients. Over high heat in a large Dutch oven or large heavy ovenproof pot add enough canola oil to sear the short ribs. Once the oil is shimmering, in batches, sear the short ribs on all sides and return to the baking sheet. Reduce the heat to medium high. Add in the onion, carrots, garlic, celery, and season with salt & pepper. Stirring occasionally with a wooden spoon until the onions start to brown, about 3 minutes. Crack the first beer, take a drink to test it for consistency <smile> and deglaze the pot with the beer. Use the wooden spoon to break up any pieces of meat stuck to the bottom from searing the short ribs. Crack the second beer, consistency check, then add it to the pot. Reduce the beer to a little more than half and then add in the fresh herbs. Return the short ribs back and add enough beef stock just to cover the short ribs. Once boiling, cover with a lid, transfer to the oven, and braise for 2-2.5 hours. Check after 2 hours and then every 15 mins until the short rib meat fibers separate when pushing down on them, but are not completely falling apart. Transfer the short ribs to a heat proof container. Strain the braising liquid through a fine mesh strainer into a deep bowl. As the liquid begins to cool skim the fat from the top. Once the fat is removed, strain the liquid back over the short ribs. Serve now or refrigerate for up to 3 days. I personally think they are better letting them refrigerate for at least 24 hours.